In honor of Hug Your Cat Day 2014, I'm featuring the last photo taken of Tara and I together, and the first taken with Truffles. This picture was taken on Christmas Eve 2012. I knew it would be our final Christmas together and it was a bittersweet day. Six months later she was gone. What I wouldn't give to hold her in my arms one more time. 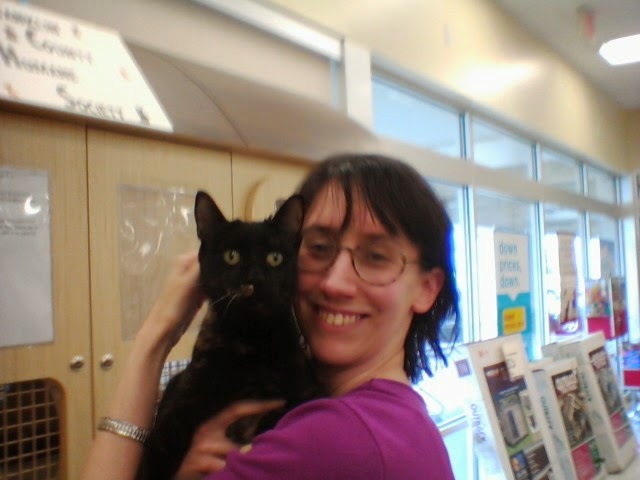 This one was taken on a much happier day...this is the very first time I held Truffles on the day that I adopted her. It was obviously love at first sight, and that love continues to grow every single day. Aw, this is sweet and bittersweet. I know the feeling well. Happy hug a cat day. 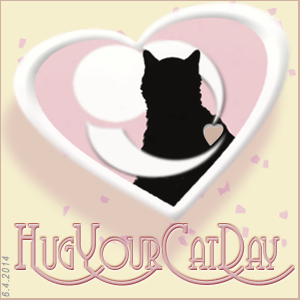 Sweet photos and so appropriate for Hug you Cat day. Hugs all around we say! Happy and sad, often they come and go together ... lovely photos and memories. Happy Hug Your Cat Day! I am hugging Stan and Quincy now! What a great tribute to all. they are both sooo beautiful! I could just kick myself that I didn't include a photo of my Angel Bobo, yours are just wonderful! how sweet. THank you for sharing. Such beautiful torties. Such sweet photos and cats! I echo your feelings about holding our beloved RB kitties one more time. We will one day, I believe. 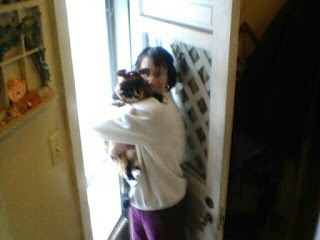 Abby was the only one who really let me hold her for any length of time. So I truly miss that. I am so glad you have Truffles to help heal the ache of the loss of Tara. Poor Truffles. I know how it is playing second fiddle to the cat who came before. Nicky was TW’s “snuggle bunny” of a cat. What she wouldn’t do to hug him again. She’s all choked up (again) typing this. She couldn’t pick him up cos he weighted 22 1/2 lbs. Great photos - so sweet. Thanks for sharing them. Truffles was such a beautiful kitty. What wonderful memories. Beautiful photos! Your photo with Tara--well, I couldn't help tearing up, and the photo of Truffles is precious! I always love reading your blog! Thank you for sharing! Great memories. We are sending you hugs on this special day. Happy Hug Your Cat Day. Such happy memories. I still miss cats that I owned years ago too. I know what you mean about missing you cat... I'm a little late but happy hug day with Truffles !